Description: Detail from the 1744 map "Carte de la Louisiane cours du Mississipi [i.e. Mississippi] et pais voisins : dediee a M. le Comte de Maurepas, ministre et secretaire d'etat commandeur des ordres du roy / par N. Bellin ingenieur de la marine, 1744 ; Dheulland sculp"e; showing the south-central portion of the Florida peninsula. Major rivers, including the R. Amajuno and S. Joseph. European and Native American settlements including Silles and Tampa are shown. 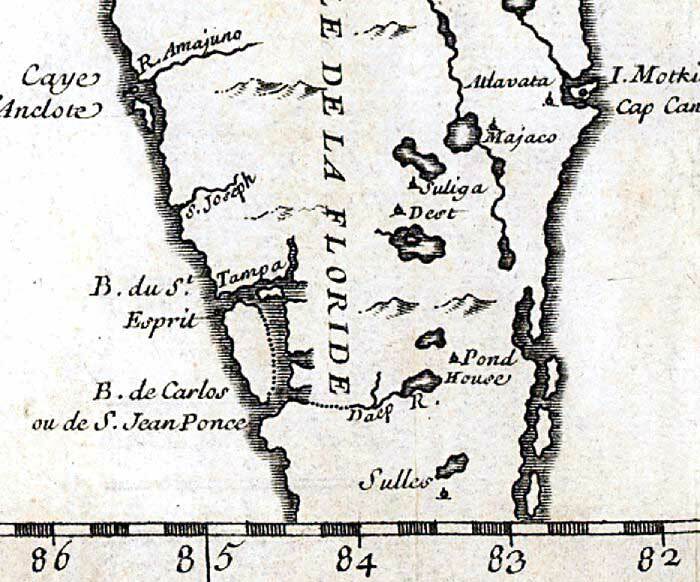 The map shows Baye du S. Esprit (Tampa Bay) directly connected to Baye de Carlos (Charlotte Harbor). Relief is shown pictorially, and longitude is based on the Paris prime meridian.